The competing rally and forum is organized by the Independent Women's Forum, which program director Julie Gunlock describes as a "conservative, libertarian, free-market" organization. WASHINGTON — Two different events focusing on women will kick off one block apart physically — and worlds apart politically. At Freedom Plaza will be the Women’s March, now in its third year. It has been at the focus of controversy recently over an organizer’s connection to the Nation of Islam’s Louis Farrakhan. Organizers say the march’s agenda includes racial and reproductive rights, ending violence against women, supporting LGBTQ rights and universal health care/Medicare for All. A competing rally and forum, billed as the March for All Women, is being organized by the Independent Women’s Forum, which program director Julie Gunlock describes as a “conservative, libertarian, free-market” organization. The March for All Women, Gunlock said, is an alternative to the Women’s March. Its forum and rally will be held at Pershing Park. “We want to be there as a place for women … who feel maybe that they’re not included,” she said, “or aren’t really welcome” at the Women’s March, which has billed itself as part of the resistance against the administration of President Donald Trump. Linda Sarsour, one of the organizers of the Women’s March, said everyone is welcome. 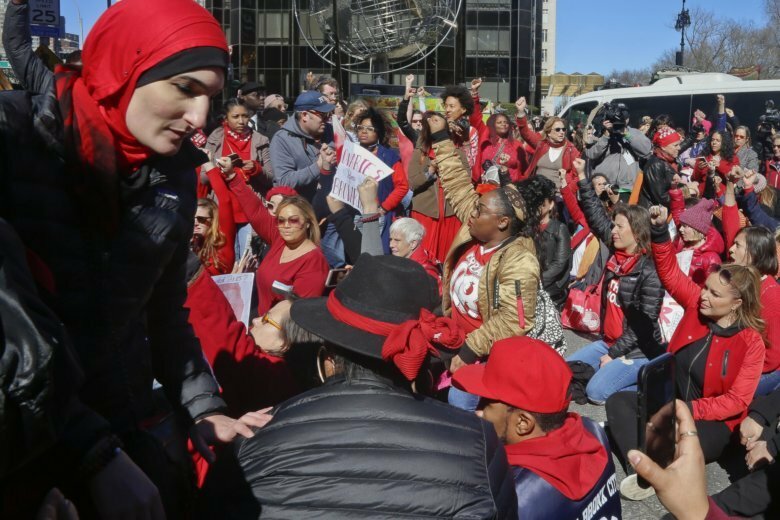 Sarsour did say, however, that the group has a clear agenda that includes pushing for universal health care and preventing violence against women, for example. “We want to celebrate being a woman and the choices we have in our society,” she said. The Women’s March agenda includes a platform that calls for “paycheck fairness” to combat wage discrimination. Jewish women have been a critical part of the movement in her organization from the start in 2017, Sarsour said. “We have three women who are serving on our steering committee, and in fact we will have multiple Jewish women who will be on the stage on Saturday sharing inspirational words,” Sarsour said. A group called Jewish Women of Color has also voiced its support for the Women’s March. Gunlock said there are other reasons that — according to her group — conservative women do not feel welcome at the Women’s March. “We can pretend that women didn’t vote for Trump, but they did. And I think Trump supporters are not welcome” at the Women’s March. Sarsour repeated that any woman is welcome at the event. The Women’s March will kick off at 10 a.m. at Freedom Plaza. The March for All Women rally and meetup also starts at 10 a.m. at Pershing Park.